Your eyes didn't deceive you -- it snowed in Houston today. HOUSTON — An incredible sight danced over the city’s glistening skyscrapers of Houston this morning and likely caused many to rub their eyes and shake their heads. No, it wasn't your lying eyes but rather the earliest snowfall ever observed in the city of Houston and surrounding areas. 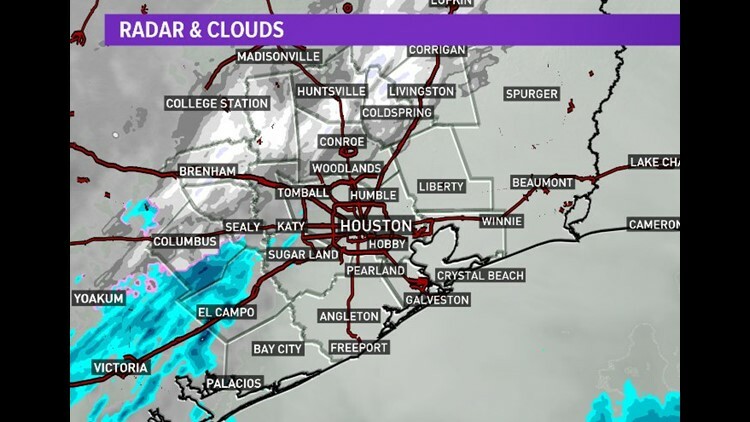 It's official, according to the National Weather Service, that Houston has recorded it's earliest snowfall ever observed -- and not just by a day or two but by 10 days! The previous earliest trace snow was November 23rd, 1979. In a city that is growing by 140,000 people a year, there are likely transplants from up north that are rolling their eyes and bypassing the chuckle for a full blown guffaw. I realize that. This isn't a Buffalo, New York event where a record snow means crawling out the second floor window to get out. However, in this part of the country, whether it be one flake or a dozen, is a big deal. Did I mention it's mid November?! -It's the earliest snowfall on record for the city of Houston. Therefore, today's trace snowfall is a new record. The earliest accumulating snow in Houston is December 4th, 2009. -It's among the earliest snowfalls in College Station--although their all-time earliest is November 4th. -Hobby Airport also recorded it's earliest snowfall on record therefore setting a record for the day. -Galveston, per our towercam at the station, is showing snowflakes. We're waiting on the official report from the National Weather Service to call it official. If it did, it too will be the earliest on record. -For the second year in a row, we beat both New York City and Boston for the earliest observed snowfall. I can't stress how big of a deal this is. As Brooks told me, this is like getting a freeze in Boston in August. It's extreme by any measure. Anecdotally speaking, having grown up here, I have never witnessed anything like this in the past 30 years. Alas, there are more records and superlatives on the way! We are currently under a Freeze Warning area wide (with the exception of the immediate coast). All precautions should be taken to protect tender plants and animals. This will NOT be a pipe bursting freeze. However, backflow preventers will want to be turned off and drained. They will need to be wrapped or risk having them bust overnight -- especially for the more rural areas north and west of Houston where the mercury could tumble into the mid to upper 20s tonight Wednesday morning and Thursday morning. If Houston's Bush-Intercontinental Airport hits freezing tonight, it'll be the earliest freeze there in 19 years (1999). If Houston's Hobby Airport reaches freezing tonight, it'll be the earliest freeze there in 50 years (1968)! While it's very early in the year to see snow and freezes, this is in no way a bearing on what the rest of the winter looks like. Some winters get off to a roaring start and then peter out soon after. Some start warm and end cold. Some winters start warm, then a major arctic blast hits that brings single digits and snow by December and then warms up again. That happened in 1989. So while this snow event will be over shortly, it'll rage on in the minds of all of us over the next few days and will leave many wondering if this is Mother Nature's "shot across the bow" for what may lay ahead. Do you like my blogs? Please give me a follow HERE on twitter. I'd really appreciate it.